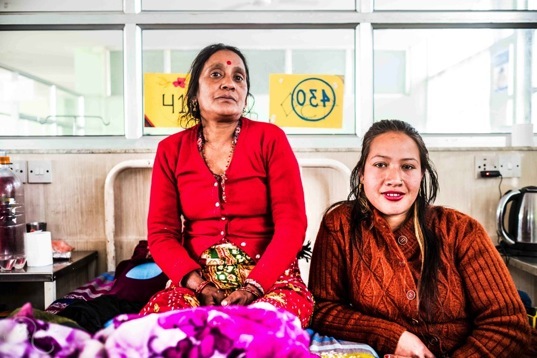 From December 26, 2016 until present, 54 women have received medical treatment through our continued collaboration with Nepal Medical College Teaching Hospital in Jorpati, Kathmandu. Here are some of their stories. Krishna Kumar Aryal (70 yrs.) with her grandson. Krishna married when she was 9. She gave birth to seven children, five of whom are alive. Krishna first found out that she had uterine prolapse when she was 33. Her household chores include cooking, washing, cleaning, farming and cutting grass. Janka Bhattarai (40 yrs.) with her daughter. Janka married when she was 17. She gave birth to five children, four of whom are alive. Janka developed first signs of prolapse when she was 22. Simrita Gupta (65 yrs.) with her son Dip Narayan Gupta. Dip is her only surviving child out of eight children whom she gave birth to. Seven of her children died from various illnesses. 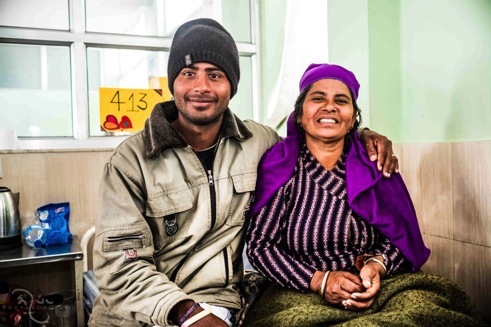 Throughout her stay at the hospital, Simrita seemed extremely attached to Dip and would be anxious whenever he was out of her sight. Simrita was 12 when she got married. Naran Devi Khadka (42 yrs.) with her daughter who works in a carpet factory in Kathmandu. Naran married when she was 14. She gave birth to four children. Naran first developed signs of prolapse when she was 34. Saraswati Yadav (68 yrs.) with her son. Saraswati married when she was 5. Shegave birth to four children, three of whom are alive. Juna Devi Bhattarai (54 yrs. ), with her daughter Sanjita Bhattarai. Juna developed first signs of prolapse at 51. Her current workload includes farming, cooking, washing dishes and clothes, cleaning and looking after her grandchildren. Sarswati Nou (69 yrs) with her husband. She married him at age 10. He seemed very caring and they seem to have a happy marriage. When Sarswati saw this picture she giggled and said “He looks very nice, but I don’t look nice” And when she was asked about her current workload at home she giggled and answered “nothing, because I am old.” She found out that she had uterine prolapse when she was 63. Radha Bhujel (55 yrs.) with her son. She married when she was 18 and gave birth to eight children, seven of whom are alive. Her husband works as a carpenter and she helps with farming and other household chores. Laxmi Pariyar (middle) 54, with her two daughters. Laxmi married when she was 14 and delivered her first child at 15. 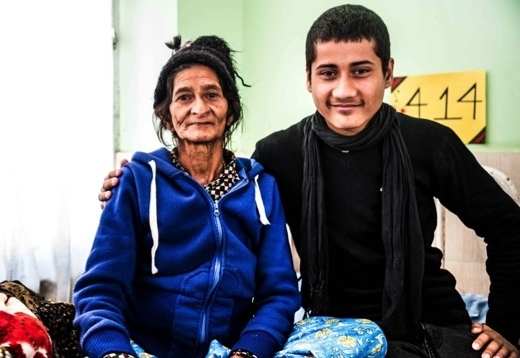 Laxmi discovered that she had prolapse when she was 19. Radhika Dhakal (50 yrs.) with her son. Radhika married when she was 8 to a 32 yr. old man and gave birth to two children. She developed prolapse when she was 20. Kanchi Nagarkoti (51 yrs.) with her son. Kanchi married when she was 16. She gave birth to four children. Kanchi found out that she had prolapse when she was 46. Sabitra Tripathi (middle), 70 yrs, poses for a picture with her husband, on their return home after she spent 3 weeks at the hospital. Sabitra was 9 yrs old when she married and gave birth to four children, three of whom are living. She developed prolapse at 60.